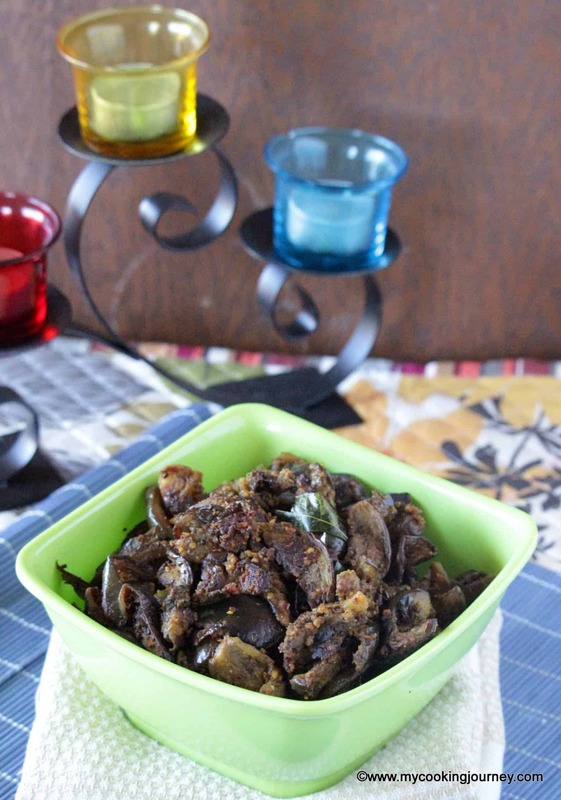 Kathirikkai rasavangi is a very common preparation in lot of South Indian household. 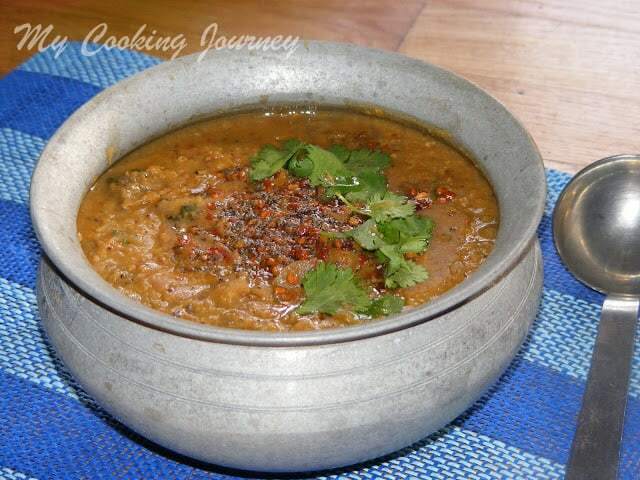 If you want a change from the regular sambhar, this is a great option. I love this for the fact that this recipe is loaded with the vegetable. 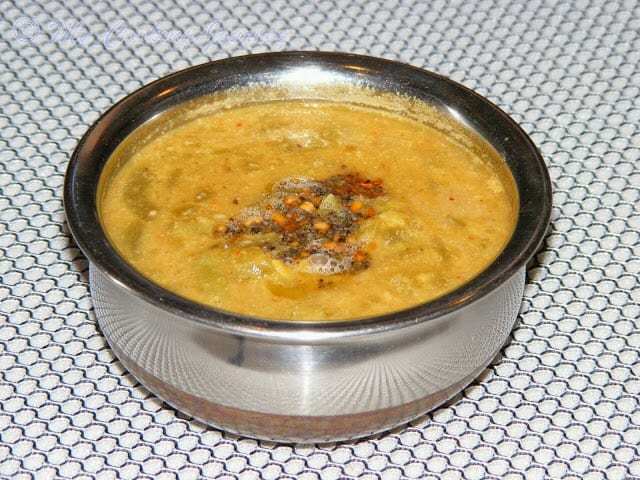 I generally like my sambhar or kuzhambu to have lot of vegetable in it. By lot I mean the quantity of the vegetable. 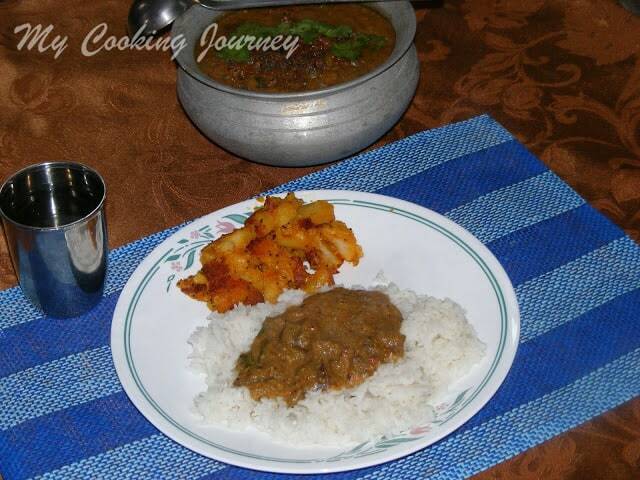 So this is one of my favorite dishes that I make very often at home. 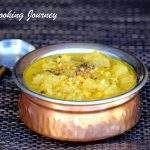 Most of my South Indian recipes are my mother’s recipe, but there are few out there that I make from other sources as well. 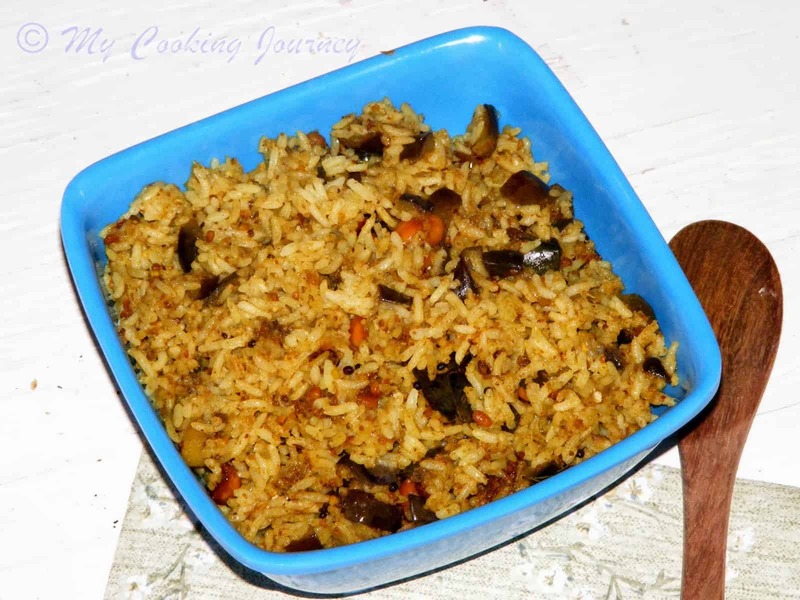 This recipe is from the famous cook book ‘Cook and See’ (Samaithu par) by Meenakshi Ammal. I am very fond of her recipes and her cook books are my go to source when my mother in unavailable to answer my doubts and questions. When I got married and came to USA, her three volumes of cook book were my only source of cooking. 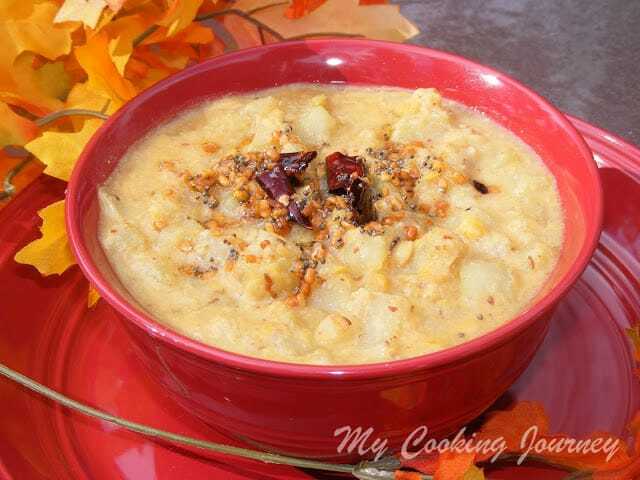 Her recipes are very close to our everyday homemade recipes in taste and flavors. When I enrolled for the BM theme, cooking from a cookbook, I thought I have to begin by making something from my ever popular and most used cook book first. 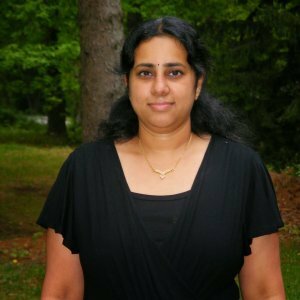 This is sort of a Thank you note to my favorite cook book author, Meenakshi Ammal. Cooking from a cook book theme is a wonderful way to let the world know of recipes from cook book that we cook. I am big fan of cook books and I have so many of them that I had a hard to choose where to begin. Thanks to Srivalli to include this in the BM theme. For the next three days, you would see my recipes that I cook using a cook book. 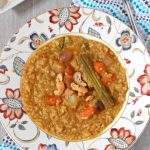 Cook the thuvaram paruppu in enough water until soft and mushy and keep aside. 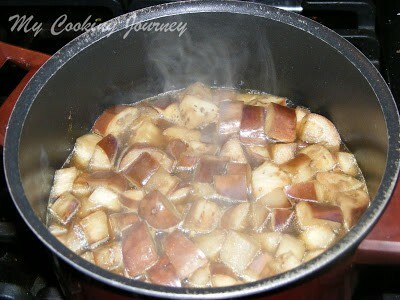 Soak the tamarind in hot water for few minutes and extract the juice from the tamarind. Squeeze the extract by adding water for about 3 times and keep the water separately. 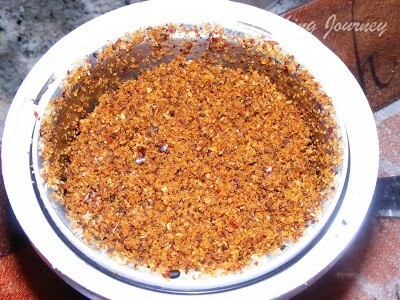 Fry all the ingredients listed above and grind into a coarse powder. Keep aside. Cut the eggplants into 1 inch chunks. 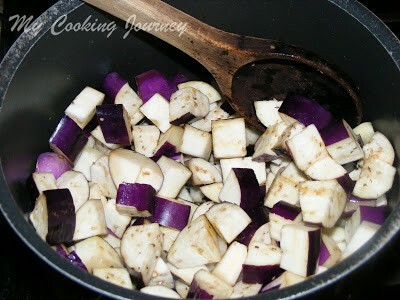 Heat oil and add the eggplant chunks and scald it for few minutes until the eggplants start changing color. Now add the extracted tamarind water to the eggplant. Make sure that the water covers the vegetable. Add salt and turmeric powder and let it boil until the vegetable is cooked well. 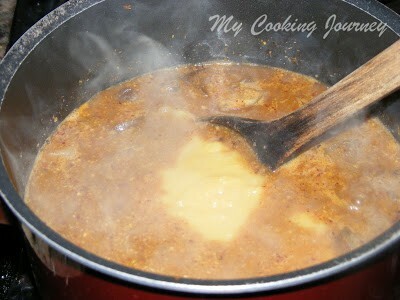 Now add the ground powder and cooked Paruppu and mix well. 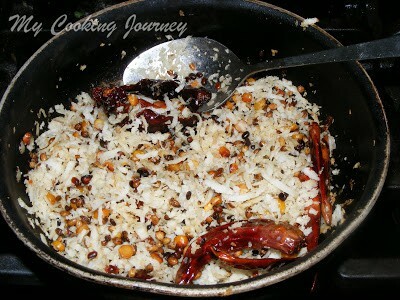 Also add the asafetida and curry leaves and let the mixture come to a boil. 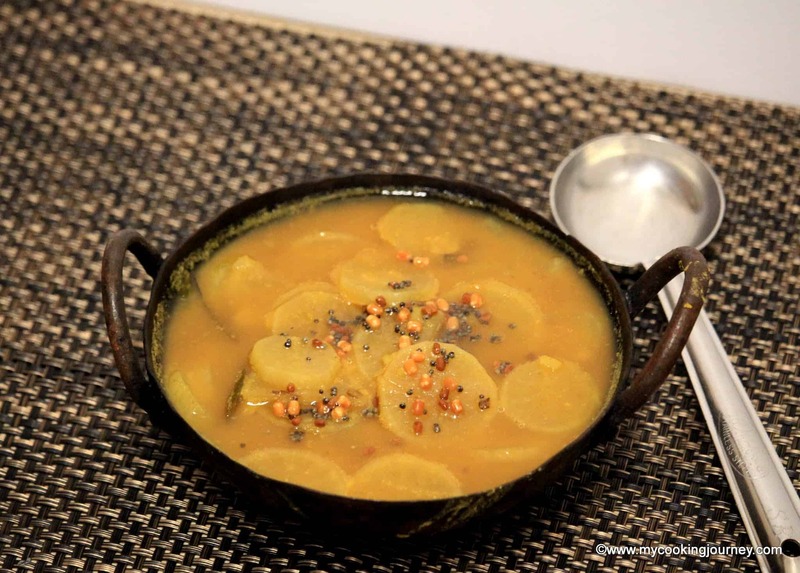 Season the cooked rasavangi with mustard seeds and urad dal and serve hot with rice. 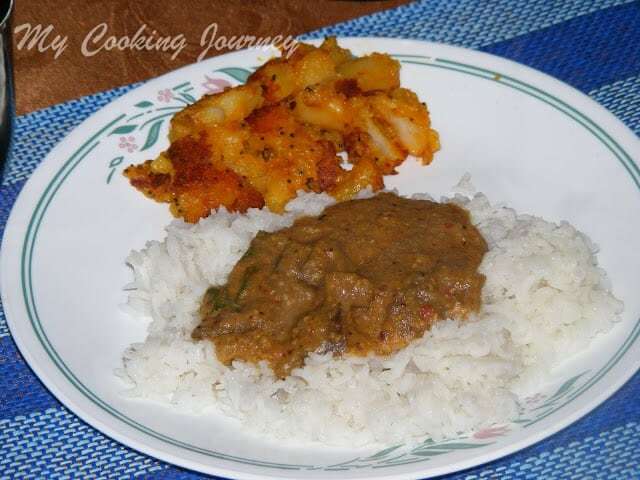 I served the rasavangi over hot rice with spicy potato curry on the side. Check out what my other friends are cooking for the Blogging Marathon #25 ! The paste for the brinjals looks very inviting. I dont remember eating it ever this way 🙂 Good one. 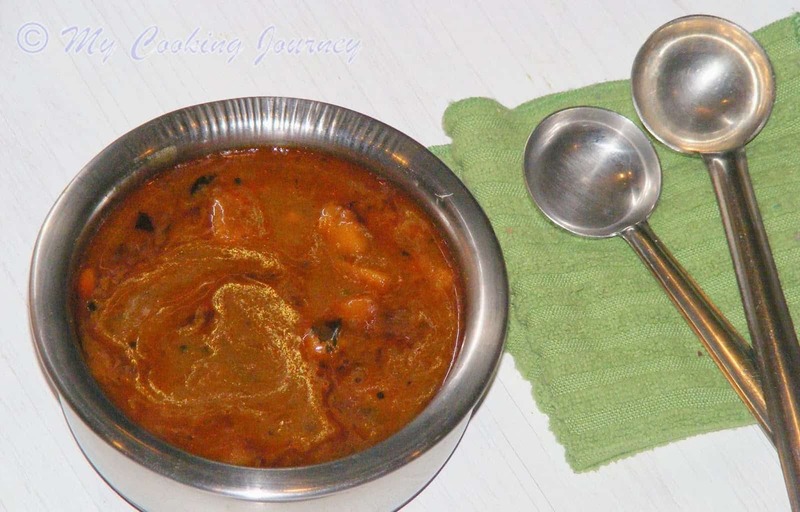 Love this authentic gravy..Super combo with potato fry..Yum. New dish to me.I bet it tasted awsome with potatoes. Looks very inviting…I love rasavangi..
A very tempting platter. My mom makes rasavangi and is probably one of her favs. 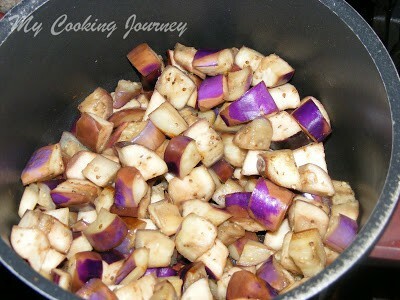 Owing to allergies, I avoid eggplant and so this is out of my realm! I can die for this stew, my all time favourite, very tempting. Such a quick and tasty dish. I recently tried this dish and loved it. Yours looks delicious. 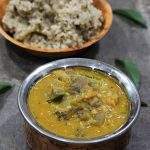 I also like Samaithu paar, but just wish they would release a copy with a better presentation of ingredients and method. 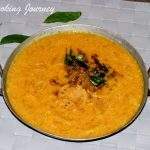 Else, its a huge repository of traditional recipes!